Home / Workshop Report: Cowslip Workshop June 10th 2017. Pie Crust Cushions and Disappearing Nine Patch. Workshop Report: Cowslip Workshop June 10th 2017. Pie Crust Cushions and Disappearing Nine Patch. 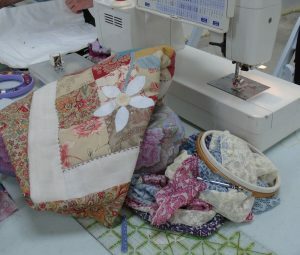 June 10th was a good day for a workshop, being drizzly and conducive to staying indoors and sewing. There was plenty of room to park and unload next to the large barn where tables were laid out for sewing machines to be set up. Jo had a number of pieces on display and there was tea, coffee and biscuits on hand. What more could you want? 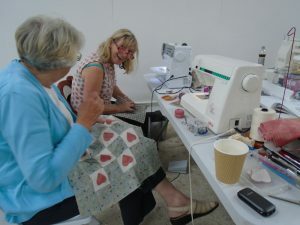 When everyone had arrived and unpacked, Jo gave a brief talk about making the fused raw-edge, applique panels for the front and back of the cushions along with copious notes and designs. Some people wanted to make disappearing nine patch blocks and these were also covered. Then it was back to our sewing stations to decide what we wanted to do. At this point some of us discovered a need for a trip to the shop! Jo had also made us free of her scrap bags and threads. I chose to make a small pie crust pincushion, using fabric I had dyed myself. As it was a small piece I decided to leave my machine in its bag and hand stitch the applique after fusing it. Other ladies were more ambitious and soon there was a queue at the irons and sewing machines were working busily. All too soon it was time for lunch. A table had been reserved for us in the café and the food was up to its usual high standard. As our orders had been taken already we did not have to wait long and could return to our sewing or a little more shopping. The rest of the day passed very quickly and there were some completed items in the display. My pincushion was completed later at home and is already in use. Thank you, Pat King and SWQ for organising the day.